While the addition of telemedicine in practices is growing at a rapid rate, some providers hesitate to add this technology. We understand that the thought of adding additional appointment slots to an already busy day can be daunting. 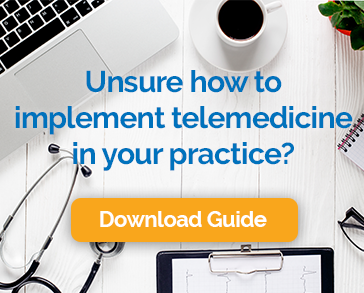 That’s why we’ve analyzed our top clients to come up with the following best practices to fit telemedicine into your practice schedule. Here are the 4 steps to see patients over video without overwhelming your current workload. 1 Hour Video Visit Blocks: Adding a one hour block for video visits twice per week is a simple solution to more video visits per week. With each video appointment running 15-20 minutes on average, this allows for an additional 6-8 weekly appointments. Some of our top performers have also expanded on this method by blocking two mornings per week exclusively for video visits. With the efficiency of video visits, we have some providers that are able to see an additional 25-30 patients per day. 30 Minute Video Visit Blocks: Adding four 30 minute blocks per week allows you to supplement typically slow business hours with video visits. Similar to the one hour blocks, if each appointment runs 15 minutes, this is an easy way to add eight video visits per week. 2 Video Visits Per Day: Adding one morning and one afternoon video visit each day is a quick way to add 10 visits per week. This method is also convenient for your patients as there are 2 options for video visit time slots each day. An informed staff will be more effective at suggesting video visits to patients as well as promoting these types of appointments in your practice. Now that you have the slots on your schedule, how do you fill the appointments, besides recommendations from staff? We’ve found that patient marketing is key to success here. Use these great resources to help get your patients on board with telemedicine: custom patient web pages and email blast campaigns.